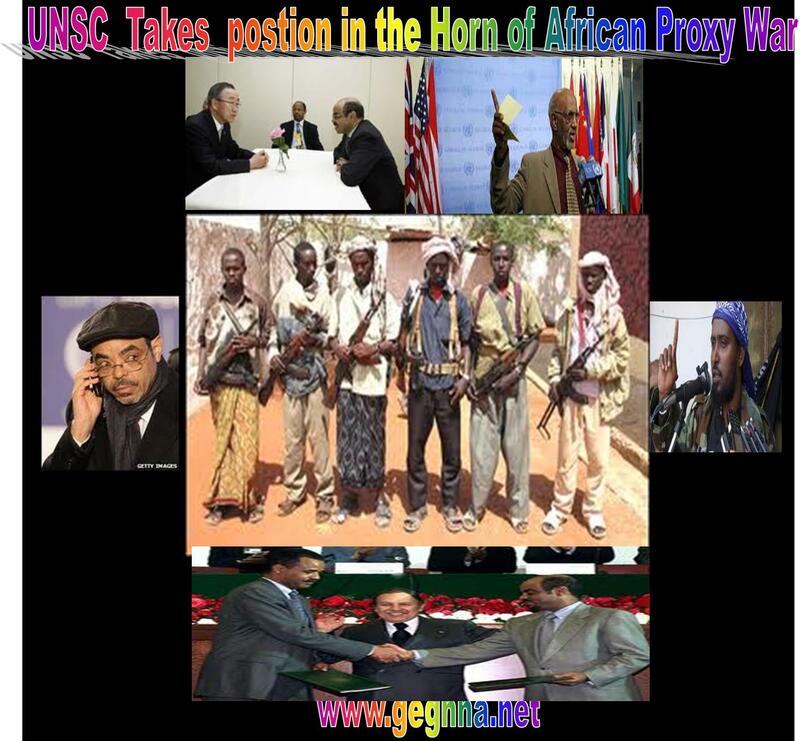 The UN Security Council based on the resolutions 751 (1992) and 1907 (2009) concerning Somalia and Eritrea brought out an allegations which eventually strengthens the regime in Addis search of regime change in Asmara. The U.N. report included a letter from Romania confirming a sniper rifle found in the possession of one of the bomb plotters had been sold to Eritrea in 2004. The report included slips showing payments to the plotters in Addis Ababa through money transfers. The plotters told the U.N. that an Eritrean colonel had arranged for the transfers via intermediaries in Sudan and Kenya. Ethiopia routinely accuses Asmara of supporting rebel groups. In a shift of policy, Prime Minister Meles Zenawi declared in April it would support Eritrean guerrillas fighting to overthrow President Isaias Afewerki. However, Melese Zenawie these days seems too look for the UN mandated overthrow overthrow of the regime in Asmara. Since the most aclaimed proxy wars seem not working any more. The report also included copies of payments slips from Eritrean officials in Kenya’s capital Nairobi to known members of Somali rebel group al Shabaab. It said the payments were to the tune of $80,000 a month. “The Monitoring Group has obtained documentary evidence of Eritrean payments to a number of individuals with links to al Shabaab,” the report said. “The documents obtained were received directly from the embassy of Eritrea in Nairobi, including payment vouchers marked ‘State of Eritrea’,” the report said. The Eritrean government Ministry of Information immediately rejected this allegation as the fabrication of the Ethiopian regime. The full report – all 417 pages are all the previous reports which are packed with fascinating detail about the inner workings of Somali piracy, the origins of illegal arms flows and the structure of al-Shabaab, Somalia’s Islamist insurgency. The UN-backed Transitional Federal Government is ineffective, divided, and corrupt and its leadership lacks vision so is incapable of providing leadership or bringing stability. Saracen International committed “egregious violations of the arms embargo” by setting up a military training camp and deploying foreign security personnel in the semi-autonomous region of Punt land. The allegation also accused the company having links to Xe Services, formerly known as Blackwater. The only lasting solution for the conflict of the horn of Africa’s wanton conflict is to find a definitive peace between Addis and Asmara based on the retreat of all foreign forces from Somalia. The conflict in Somali is manipulated by the Melese Zenawie for two main reasons – to keep himself in power proving as peace keeper in the horn of Africa to fighting Al-Qaida, and secondly a battle ground for incrimination of his enemy the regime in Asmara. And finally let the regional governments of Somalia to handle the conflict by empowering them- that of Somaliland & Puntland to deal with Mogadishu and South Shebele regions. The Security Council Committee established pursuant to resolution 751 (1992) concerning Somalia was established on 24 April 1992 to oversee the general and complete arms embargo imposed by resolution 733 (1992) and to undertake the tasks set out by the Security Council in paragraph 11 of resolution 751 (1992) and, subsequently, in paragraph 4 of resolution 1356 (2001) and paragraph 11 of resolution 1844 (2008). The Security Council first imposed a general and complete arms embargo on Somalia on 23 January 1992 with the adoption of resolution 733. Certain exceptions to the arms embargo were adopted by the Council in its resolutions 1356 (2001), 1725 (2006) in paragraph 6 of resolution 1744 (2007), and reiterated in paragraphs 11and 12 of resolution 1772 (2007). Additional exemptions were authorized by the Security Council in paragraph 12 of resolution 1846 (2008) and 11 of resolution 1851 (2008), with respect to efforts to combat piracy off the coast of Somalia. By its resolution 1844 (2008), the Security Council decided to impose individual targeted sanctions (an arms embargo, including training and financial assistance, on individuals and entities; a travel ban on individuals; and an assets freeze on individuals and entities, as designated by the Committee). The same resolution provides exemptions from the measures and expands the mandate of the Committee. The sanctions regime is summarized in the table below. Consolidated List All States shall immediately implement a general and complete arms embargo on all deliveries of weapons and military equipment to Somalia until the Council decides otherwise.Member States shall take the necessary measures to prevent the direct or indirect supply of weapons, military equipment, technical assistance, training, financial and other assistance, related to military activities, or to the supply of arms, to the individuals or entities designated by the Committee. Set out in paragraphs 2 and 3 of resolution 1356 (2001), in paragraph 6 of resolution 1744 (2007), and reiterated in paragraphs 11and 12 of resolution 1772 (2007), as well as in paragraph 12 of resolution 1846 (2008) and paragraph 11 of resolution 1851 (2008). A Panel of Experts was established by resolution 1425 (2002) to generate information on violations of the arms embargo with a view toward strengthening it. The Panel of Experts was succeeded by a Monitoring Group established pursuant to resolution 1519 (2003) to focus on the ongoing arms embargo violations. The Monitoring Group continues to be in operation and its mandate was most recently extended for a period of 12 months by resolution 1853 (2008), and expanded in light of the new sanctions measures, to carry out the tasks set out in paragraphs 23 (a) to (c) of resolution 1844 (2008). As the Monitoring Group commenced its work in March 2009, its current 12 months mandate will run through the end of March 2010. The current Chairman of the Committee, for the period ending 31 December 2011, is His Excellency Mr. Hardeep Singh Puri (India). The two Vice-Chairs for 2011 are Lebanon and Nigeria. The Committee publishes annual reports of its activities. The Committee has guidelines for the conduct of its work.